#4259998 Best Super Game Boy games? The file name of the BIOS does not need to be anything special, unlike the Nt Mini. Just select your BIOS, ensure the checkbox is enabled, then load a game on the SD card. Sega goes with M2 while atgames cries boo-hoo. I think there may be a bug (as I don't remember it on my model 1) if you go in to the Options menu on TMNT Hyperstone Heist if anybody else could check out to see if it's present on your Mega Sg. There seems to be some weird shaking going on with the screen/dithering effects. Get close to your tv screen. That's the only place I've noticed it so far. It's not really a big deal cause how much time would you actually spend in the Options menu, but just wanted to report it. 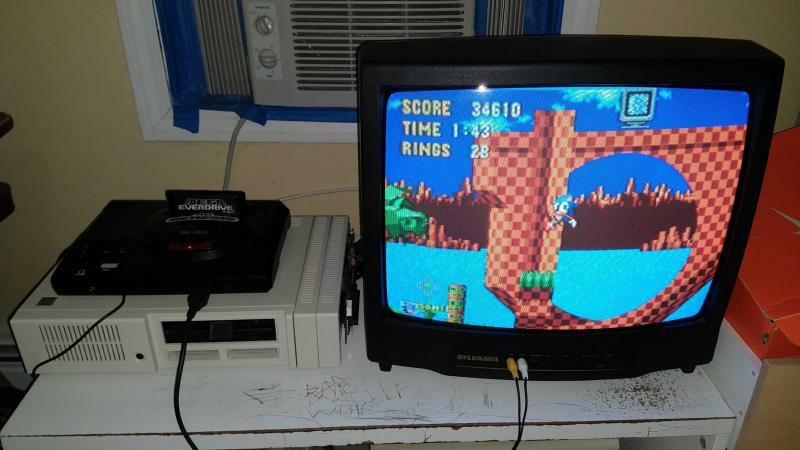 That is no Mega Sg bug, those pixels shift back and forth on every frame. It is almost impossible to see with composite video, but with RGB its quite noticeable. Turn on the dedithering function and the pixels will show solid strips except around the edges of the text characters. I'm running the game on a Mega Everdrive X7 but unfortunately I don't have an OG Genesis to confirm if the issue is just with the Mega Sg. I believe Meteoric Shower is overdumped by 4K. Meteoric Shower is included as the built-in game in the Dina 2-in-1. If you separate the game from the BIOS, which is 8K and remove the last 4K from the standalone ROM, the two files differ by exactly one byte. That byte is an ASCII 3, as in Copyright 1983 for the BIOS version, and 6 as in Copyright 1986 for the cartridge version. I use one of these custom sticks (bought a BX-91 from the first batches when it was a bit cheaper) and have been very happy with it. Way too expensive for a featurless NES controller, even in the larger $110 variant, Sanwa or no-Sanwa. Only took one Spider Man game to put you off Spider Man games for life? Marvel video games on 8-bit and 16-bit consoles rarely rose above mediocre status, but Spider Man games were lucky to get even to that relatively-hallowed status. I updated my Super Nt Unofficial Manual today to cover the Ghostly x Analogue Edition's firmware and a few minor changes. Enjoy. Both Kevtris and Sorgelig are amazing, and it is absolutely childish to argue which one is more talented than the other (yeah, I know that you didn't). They just seem to have very different styles. Kevtris developed twenty-two retro video game console FPGA cores and has released twenty of them. Sorelig has ported several open source FPGA cores written by others to the MiSTer hardware. To compare the achievements of the former to the latter is to compare a star to a telescope. The first is luminous, the second merely a conductor of light. A few days late, but better late than never. Here we have four games and two demos added! So, does a "no cheat" live million point verification mean he's reinstated as a record holder? Or is it like athletes who dope, once exposed, banned for life? He isn't reinstated automatically, he'd have to petition the authorities that recognize high scores to approve his. In the case of Twin Galaxies or Guinness Book of World Records, that petition would be instantly rejected. The Donkey Kong forum indicated it would consider his request, if he made it. But "I'm Billy Mitchell" isn't likely to do so. I don't see this quite in the same way as doping athlete. Once you take away the cheater's ability to cheat in a video game,they are just like everybody else. Doping athletes have caused their bodies to be modified unnaturally, a process for better or worse can never be completely reversed. Given the difficulty in detecting the usage of modern anabolic steroids, it can be impossible to tell if a "reformed" athlete has truly abandoned the performance enhancing drugs that lead to victory in the past. Former cheaters deserve enhanced scrutiny of their post-downfall accomplishments, but if a machine can be verified to be unaltered and a score to be proven legitimate, then the logic that applies to dopers doesn't really work for cheaters. If Billy can rack up over 1 million at the age of fifty-two on two occasions, one wonders what he could have done at forty-two if he applied himself legitimately rather than doctor footage of himself obtaining a high score. What games does sd2snes not play that people would want to play? Answer = none. I saw it as stupid to with the limits of it all to jailbreak the SuperNT as there were better options. But, are you saying it can do the DSP1 for Pilotwings and Super Mario Kart? That would be decent if at least that level of games ran as there were quite a few DSP titles. Ultimately in the end the FX, SA1, C4 and SDD1 run so little of any consequence it's not really that huge of a deal as it would put it on equal footing with a Super Everdrive. At that rate it's an easy pill to swallow for a SD2SNES given it will run such things and those games add up far nastier than the $200 price tag the kit has. The Super EverDrive has the advantage of being able to run the DSP1-4 games over the Super Nt jailbreak, but the EverDrive has to erase and write games to a flash chip, and that can take several seconds for a larger game. There are really two games most people run with DSP chips, Super Mario Kart and Pilotwings. The other special chips run more games of consequence, Mega Man X2 and X3 for the C4, Star Ocean for the SDD1, Star Fox, Star Fox 2 and Yoshi's Island for the Super FX and Kirby's Dreamland 3, Kirby's Super Star, Jikkyou Oshaberi Parodius and Super Mario RPG for the SA-1. #4155630 What Is Classic Gaming's Greatest Need? A audio/video capture device that can accept fractional refresh rates up from 50-70Hz vertical and 15-31KHz horizontal without freaking out, analog RGB (separate sync, composite sync, luma as sync, composite as sync, sync on green), digital RGB, component video, s-video and composite video.